CONRAE II is a timber dinghy built in Wagga Wagga NSW during the 1940s for recreational use. It was also used as a flood boat. It is an example of the resourceful nature of regional Australians using available materials to build a simple vessel for their own purpose. The timber home-built construction reflects the period before local markets were supplied with mass-produced goods such as the aluminium 'tinnies'. Its simple vertical sides, elementary shape and basic but strong construction are common features of regional craft, designed and built with a general understanding of what was required, but without the finesse of a shipwright's approach. CONRAE II was one of two boats of almost identical design that were built in Wagga Wagga during the 1940s by friends Hughie Leslie Condon (of Great Southern Motors) and Ernie Rae (of Rae's Garage). CONRAE I was owned by Ernie and CONRAE II belonged to Hughie. The names of the boats were derived from an amalgamation of the two builder's surnames - CONdon and RAE. Both boats were fitted with 1936/38 model, single cylinder, 1.75 kW (2.2 HP) Evinrude motors purchased from Hunter Bros. Sports Department, Wagga Wagga. CONRAE II represents the 'make-do and mend', 'waste-not, want-not' approach to living which was an ethos of the Great Depression of the 1930s. Many regional boats were made of plywood, but they were also from Masonite, corrugated iron and light-gauge sheet metal. CONRAE II is a fine example of resourcefulness and ingenuity; it was constructed from solid timber book shelves removed from the Condon home at 62 Thompson Street in Wagga Wagga. CONRAE II is typical of the well-built, sturdy flat bottom boats which were common along the Murrumbidgee River system, and were particularly favoured by farmers whose properties had river frontage. Their boats were used for many daily chores, including fixing pumps, retrieving washed away fences and larger ones were used to transport stock. CONRAE II was primarily built and used as a fishing vessel. Following a close-call one day with a drum net and fishing inspector, a pensioner friend of Ernie's successfully applied for the vessel to become a Licensed Fishing Boat, allowing the men greater freedom with their means of catching their prey. They painted the lettering 'L.F.B. 3019' next to the boat's name on the bow and then carried on as before. The biggest fish ever caught from CONRAE II was a Murray Cod, weighing over 80 lb (36 kg). Yellow bellies were also a common catch during fishing expeditions, using set lines and droppers hung under the oak trees lining the riverbanks, and yabbies and mussels as bait. River lobsters were a favourite winter-time catch, and hauls of 60-70 'keepers' were usual, using drop nets baited with bullock's livers or sheep's heads. 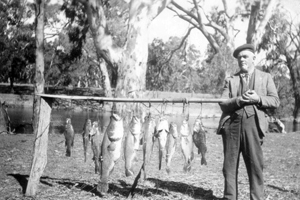 Hughie, his friends and family fished across an extensive area - from Burrinjuck in the east to Oxley in the west, the Lachlan River in the north and the Ovens River in the south. CONRAE II was also used during duck shoots and early morning pig hunting expeditions, and the boat still carries battle scars from such adventures. At this time many of the roads and tracks where fishermen wanted to go were rough and corrugated. As a result the trailers on which the boats and gear were carried had to be strong and trouble free. CONRAE II's first trailer was made from the front end of an old car chassis, complete with original wheel springs and axles modified to provide a rigid steel frame to which the boat was clamped by steel rods - no ropes to stretch or loosen and allow movement. There are four metal plates on the gunwales where the clamps fitted. There are also metal plates low down on the starboard side that cover bullet hole damage caused by the accidental discharge of a 12 gauge shotgun - according to Hughie's son, Keith Condon 'It made a big noise and that fellow never came hunting with us again!" 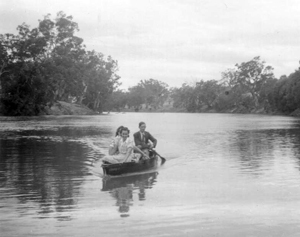 While CONRAE II is a well-remembered pleasure craft, evocative of nostalgic summertime picnics and riverbank parties, in more difficult times, particularly during the recurrent floods of the 1950s, it was a welcome means of transportation to those directly affected by the rising waters of the Murrumbidgee River. 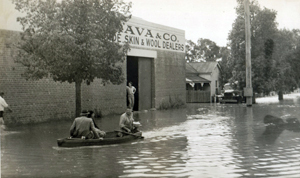 Both CONRAE I and II were used extensively in the Wagga floods of the 1950s, taking people in and out of their homes in the low parts of town and checking water levels in various homes. Keith Condon wrote in 2005 that "CONRAE II did trips from opposite the Police Station in Sturt Street to East Street in North Wagga, carrying people and food parcels across the main flood. The current was very strong in places and there was a lot of dry timber and a few animals coming down which made the crossing a bit too dangerous to continue despite the fact that we had fitted a more powerful Seagull motor. " CONRAE II remains as a vivid artefact of life on the inland rivers of New South Wales. It is an object which represents many things, and evokes numerous memories. Keith Condon best sums up CONRAE II's significance with the words: "CONRAE II is a tangible reminder of the good times that were enjoyed and the friendships that were made around the campfire by the light of Paddy's lantern when things were a lot simpler and people made their own boats!" In 2010, CONRAE II was listed as a boat of national significance on the Australian National Maritime Museum'sAustralian Register of Historic Vessels. Today, CONRAE II has a permanent home hanging in the foyer of the Museum of the Riverina's Botanic Gardens Site.